The Jelt is an elastic, unisex belt with a low-profile belt buckle, made to lie flat while you wear it. It’s a fashionable solution to two problems: Bulging, untucked tops and pants that ride down when you sit or bend. Maker Jen Perry runs a guest ranch in Montana, and found that she often inadvertently revealed her backside while in her favorite skinny jeans. So, she created a new style of flat belt to specifically address this problem—the Jelt. . . or Jen’s belt. It’s a name that has extra meaning, though, because the Jelt uses a grippy gel to give it maximum hold and elasticity. It stays up even when you’re sitting or bending down. Or running a guest ranch. As for the buckle, it’s designed to lie flat, so untucked tops don’t flare out. And since it’s non-metallic, there's no need to take it off at airport security. Plus, the Jelt is made entirely of recycled materials and comes in a variety of retro-influenced styles. So, even though it’s Jen’s belt, really, shouldn’t everyone have one? Hello Grommet! My name is Jen, the founder and creator of Jelt. 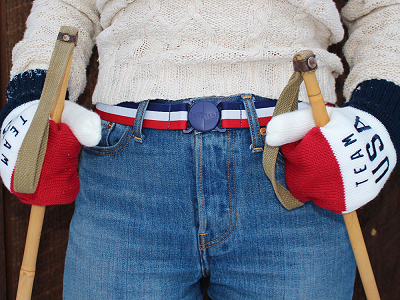 I know you'll love our super low-profile belt and all the things you can do while wearing it. I'd be happy to answer any questions you have! Happy Jelting! We are so excited to introduce our product to you on the Grommet! Thanks for checking us out! Does this belt have longevity? I bought the invisibelt and it doesn't stay closed anymore, I guess it has worn out, but it pops open all the time. Your clasp looks different but I am wondering if it stands up to the stress of bending over and pulling against the closure. 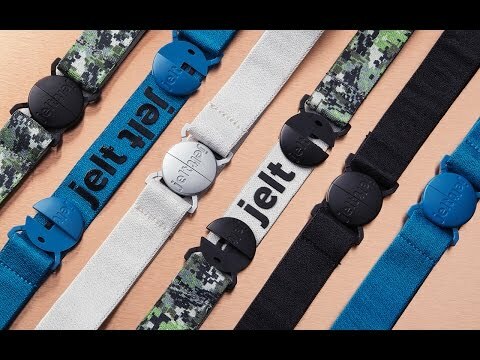 The Jelt is made from 100% recycled elastic which is much more durable than regular elastic. The recycled yarn is woven very tight, but still allows for the right amount of stretch. This gives you the ability to wear this belt everyday without it ever stretching out in your movements. The longevity is also extended due to the silicon gel lining the inside of the belt, keeping the elastic tight. This also aids in eliminating stretch in the material over time. The gel helps the belt move with you, forming to your pants when your bending over! This feature is great if your concerned about longevity because the materials actually work with you and not against you! The buckle is also made from a very strong recycled plastic which can stand up against any stress. Because the clasp is thin, we wanted to make sure that is was very strong as well so we chose recycled plastic over traditional plastic due to its strong chemical structure that makes it impact resistant and extra durable. 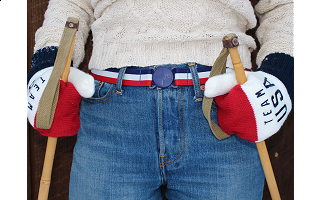 The buckle will stand up against your daily movements no matter what you are doing! We even have customers who wear their Jelts skiing and hiking because of how durable they are! The Jelt was specifically designed to be worn every day so there was a lot of emphasis on the design features affecting longevity! We hope this answers any of your concerns! On the video was a picture of someone stooping down without a belt on and their backside showing. I was surprised that was not addressed with a similar picture with the JELT on so customers could see the difference. The JELT looks nice, but where are pictures showing it works? Thanks for reaching out. You make a very good point as this is truly a product that you have to see to believe! If you would like, I can send you a few images of the Jelt in action? We have a variety of lifestyle shots of people wearing the belt in daily situation that were not shown in the video. The Jelt as so many great features, it's hard to show that in such a short video! I would be happy to give you a better selection! @Jen could you please send me those shots of the Jelt in action? Hi folks, we have just uploaded a new video that shows the types of action pictures you are looking for. Hope this helps! does it come in fat guys sizes? Yes! We offer a size L/XL which fits anyone with a waist size between 36"-40." Because of the stretch, you can wear the Jelt if your a little above 40" too. @Jen That lets me out. I am a 42. 36-40 is hardly an XL size. Because the elastic stretches, it can go up to a size 42" waist! I would like to see the additional pictures, as well. Hi Pat, a new video has been uploaded that shows the types of pictures you are looking for. I want to order the Denim Blue belt, but I need an extra large and apparently it's not available in extra large. Yet the Sporty Blue Jelt Belt IS. Why isn't the solid blue available in XL? Also, I hope someday soon you'll make a solid light-color (like white or off-white) for people to wear with summer pants so the belt doesn't show under lighter weight tops that tend to show through more. I've ordered the Sporty Blue belt in the meantime because I'm anxious to see how it works. It seems to be what I've been looking for! Sporty Blue is our lightest color, I think you will be happy with it, please let us know how it works with your garments. Great point about the white/off-white, we have some other things in the works that address similar issues: super smart point about light tone/color. Good question on the other blue:The darker blue (Denim blue) has been really popular, looking into getting that size in stock again, date TBA. @Jen Thank you, Jen! I'll look forward to getting my belt and letting you know how it works for me . I'll also look for the solid blue in XL. Thanks for giving consideration to my comments about providing light solid colored belts in the future. Janice! you are very welcome! I look forward to hearing back from you after you get your Jelt! These jelts look very nice and practical. I need a really long stretchy belt to go around a bulky wool cape, possibly as long as 54 inches. Can you make a custom belt in such a larger size? Thanks. @D A We currently aren't making any custom orders, because our factory manufacturer isn't accepting any custom orders. But, as for finding a belt to go around your wool cape I would certainly recommend a Large or XL size! You need to include width of belt. Unfortunately, my favorite pants will not accommodate more than 1 inch width. Great Question! the Jelt is an inch in width so they would work perfect with your favorite pants! and the Jelt is around 1/4 of an inch thick! Hopefully that answers your question! The width of the belt is 1-1/8" so it's a bit wider than your 1" loop. Good point, we will update this info on the site, thx!!! Hi Jen! I think your belt is awesome!! That said, I only have one comment/suggestion: I don't know if you realize that the greatest majority of people who have trouble keeping their 'behinds' covered are the HEAVY SET men and women. I am in that group. I'm a rather overweight female who has trouble buying a belt because most belt makers don't cater to overweight women. There are plenty of belts for overweight guys, but they don't "flatter the fatter". If you ever considered EXPANDING your business (pun intended) I believe you would double, triple or even quadruple your business in relation to the belt sizes you offered. I'd need closer to a 48-50 inch belt. As embarrassing as that is to admit here in public, I'd be one of your 'biggest' and best customers. I bet I'm speaking for many of the readers/shoppers here on Grommet. I look forward to someday being a Jelter!! Thanks for listening. Thank you so much for reaching out Shirley. We love your input and will definitely keep that in mind for future designs. As a new business, we are learning something new every day and we always appreciate suggestions! We are focusing on the colors and sizes that we have available for now, but are always open to changing things up to fit our customers needs! We are sorry that we cannot get you Jelting at this time, but in the future we will let you know if we ever expand into larger sizes! Please contact the Grommet experience team here to connect to us so we can keep your info on record and we will keep you updated with any new design changes! You are awesome! Thank you so much for your wonderful feedback! The design behind the Jelt that makes it so great is that it is made out of a elastic band that stretches made to move as you do! 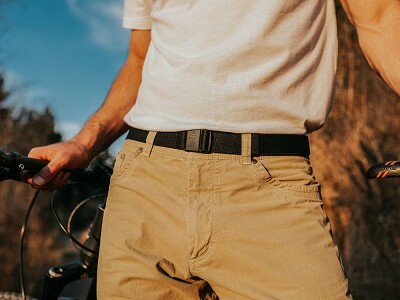 Most belts can be somewhat confining and show under your shirts, the Jelt is much more comfortable and lays flat on your pants. As for sizes, we currently just got L/XL in stock which with the elastic band can stretch up to a 42". But you are totally right! and we will be working on getting sizes XXL & Up here in the near future! I look forward to having you Jelting in the near future!! Thank you so much for your response. I'll email that address so you can keep me informed! Here's to the NEAR future! This is a great idea. Any chance of a plain black belt to use with dress pants? Thank you! We only offer the Denim Blue as our only plain color right now. It is a very dark blue though and is very popular with our customer who want a darker color. We had originally picked our colors with a sporty, retro theme in mind but plan to focus more on solids in our next round of designs. Unfortunately, the recycled yarn is very expensive, so we have to work with our original colors for now. But we have taken note of the requests for a solid black Jelt and plan to incorporate a few new colors into our line once we are a bit more established and are allowed to expand! We need people out there like you who believe in our product, then we can do anything you want! Taking it one step at a time :) Thanks for your input. not sure shat size to order for a woman pant size 12? Hi Tami, for that size, a M/L Jelt should work great. Hi Judy, as Jen mentioned above, the XL Jelt has the capability to stretch up to a 42 inch waist, but larger sizes are expected in the near future. Stay tuned!